Hockey Writers Correspondent Ted Warren recently caught up with Anaheim Ducks prospect Mat Clark. The 22-year-old defenseman spent last season in the American Hockey League playing with Anaheim’s top development team the Norfolk Admirals. Enjoy the off-season Q&A. THW: How is your off-season going so far? Clark: It’s going good so far. I’m keeping busy. I’m really excited for next year. I go to camp in September and I’m just trying to get ready for that. THW: Where are you working out during the off-season? Clark: We work out with John Tavares and a bunch of other guys on NHL contracts. The gym is called the Athlete Training Center and our trainer is Richard Clark. By the way, he has no relationship to me. THW: How was it renewing your deal with Anaheim? Clark: Anaheim has been really good to me over my years pro. It’s great to be in an organization you know and trust and we have a great group of guys and a great coach so I’m excited to be part of it again. THW: What skills are you currently trying to improve? Clark: Just trying to be a little quicker. My first two steps could always use some work. So I’m trying to get those first couple steps a little bit faster so I can get to pucks quicker and be a little more agile out there. 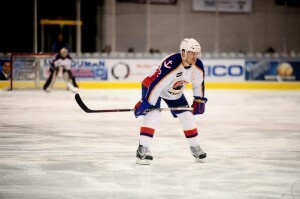 THW: What was the Admirals coaching staff message going into the last game of the season? Clark: We put ourselves in a tight spot. Going back to the middle part of the season, we thought we would be in that spot. It was a good spot to be in. We were in control of our own destiny and unfortunately we didn’t come through. THW: Glancing back on the Admirals last year, what was the Clubs high point? Clark: I think we had a good second half of the season. When we went on the playoff push that was really fun to be a part of. That set the standard for next year. Everyone will want to win and will want to be in the playoff picture. It wasn’t fun not to make it. THW: Not making the playoffs was that the low point? Clark: Yea, absolutely. We let it slip away at the end. We did so much work to get in a good spot. Nobody was happy at the end of the year and we’re going to use that to motivate us next year. THW: How did you spend your time as a black ace during Anaheim’s brief post-season? Clark: It was my second time doing it. We would practice and work out before them. We had a good group of guys. We pushed ourselves. We didn’t look at it like a vacation because any night you could find yourself in the lineup. THW: You’re known for delivering big hits. Have you always done that? Clark: Yes, it’s something I’ve always seemed to have a talent for. It’s something about the game I really enjoy and have been fortunate enough to have some great coaches help enforce that style of play for me and I love it. I love the feeling of catching a guy and really rocking him good. THW: What kind of coach is Trent Yawney? Clark: I love Trent as a coach. He’s strict when he needs to be, but he’s fair. He brings the best out in players. You may not like him sometimes, but at the end of the day he wants what’s best for you. I love playing for a guy like Trent. THW: What’s the best part about playing in Norfolk besides the fans? Clark: It’s a great city and a great environment. Virginia Beach is close by and that’s beautiful and gorgeous. It’s a great atmosphere to be a part of. It’s an all-round great spot to be. The NHL regular season schedule was released on Friday. Check out our partners at TiqIQ for the best deals on Anaheim Ducks tickets for all 2013-14 games.